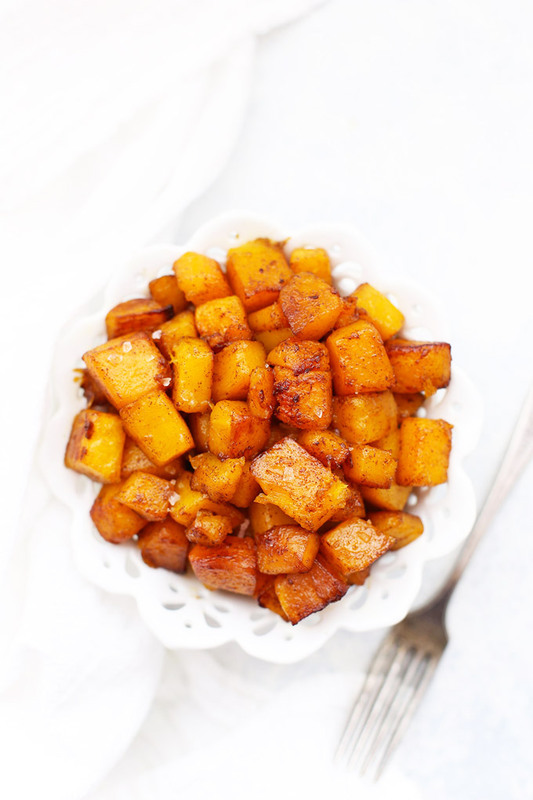 Simple Roasted Cinnamon Butternut Squash – This easy side-dish is as at home on your weeknight dinner table as it is a holiday feast. Allergy-free, paleo and vegan friendly! As we move into fall and winter, I’ve been looking for easy side dishes to add to our regular mix. Summer eating feels so easy for me–so much is fresh and ripe that pulling together meals doesn’t feel like it takes as much effort. In the summer, my side dishes are things like fresh corn, or a crisp salad with juicy tomatoes and cucumbers, or any of the abundant seasonal fruit. In the cooler months, I find I struggle to come up with great options that feel like they go with cozy-weather meals. So many of my meals are things like soups, curries, and slow-cooker favorites and for some reason, I have a hard time thinking of what to serve with them. Add to that all the Thanksgiving recipe testing I’ve been up to, and this simple cinnamon roasted butternut squash came to be. It’s easy enough for a weeknight and looks and tastes lovely enough to be a holiday side dish. It almost smelled like cinnamon rolls baking as my oven went to work on this squash. The combination of maple syrup and cinnamon was unbelievable. Everything got caramelized and gorgeous, so I had a hard time not eating it all before it got to the table! This is the kind of side you could pair with all kinds of meals (chicken sausages, rotisserie chicken, roasts, fish, etc.). Plus, you can even toss the leftovers into quinoa or green salads the next day. I love the gorgeous color and the crisped, golden, caramelized edges. 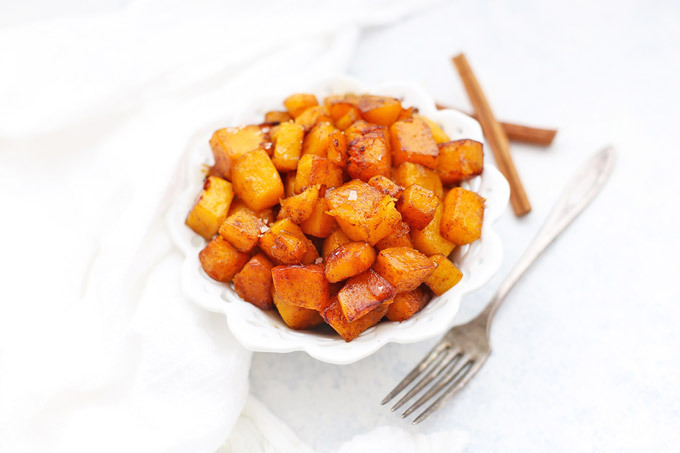 Cinnamon squash is a winner for sure! Think of Thanksgiving. 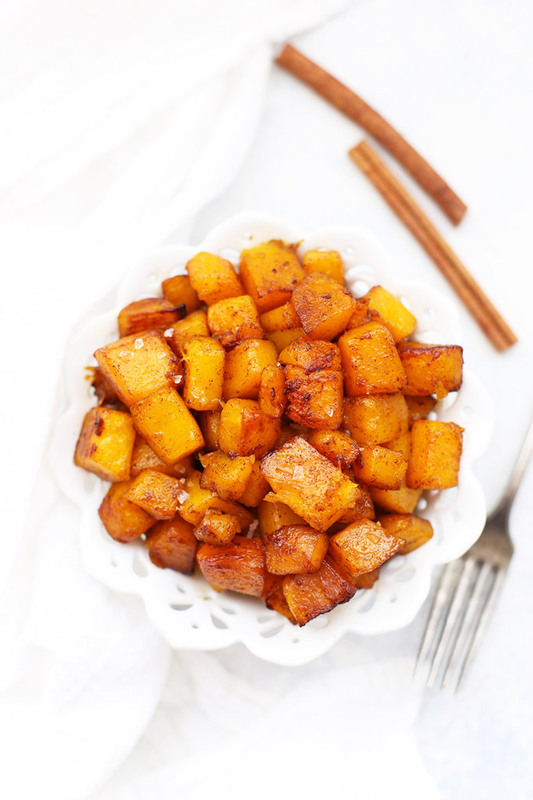 This really is a perfect side dish you could serve for Thanksgiving if you’re looking for an alternative to sweet potato casserole or need an orange veggie. It’s just gorgeous and tastes amazing, plus is allergen free and can fit almost any diet from vegan to paleo diet. Feel free to double the amounts for a crowd! 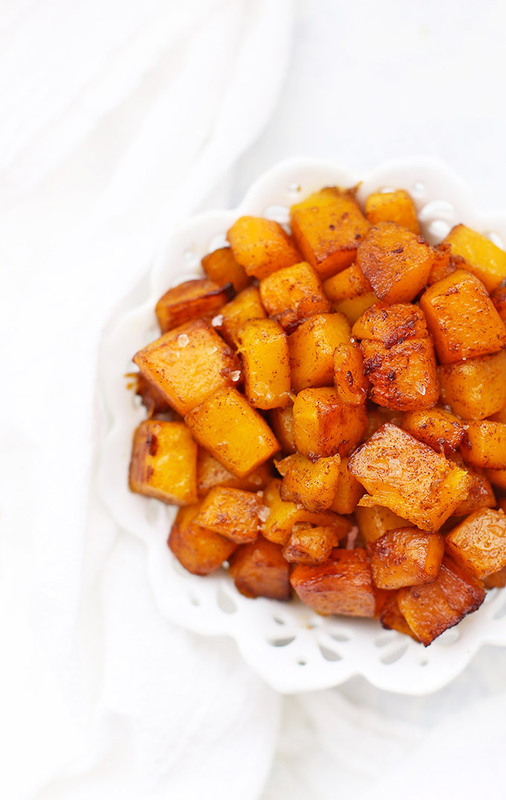 In a large bowl, mix together squash, olive oil/butter, syrup, cinnamon, and a generous pinch of salt. Stir to combine well. Baket at 375 degrees F for 35-45 minutes, or until cooked through and starting to caramelize. For even browning, stir squash every 10-15 minutes.